Information about Albuquerque's public golf courses. Green fee, bucket of balls, 1/2 car, hot dog, and drink for one low price! Golf courses are open 364 days of the year, weather permitting. Executive courses are always open to the public during an 18 hole tournament closure. Amenities: All courses offer a well-stocked pro shop with rental clubs, range balls, cart rentals, and golf retail merchandise. A cafe or snack bar is also available. Lessons: Private and public golf lessons are available for adults and children ages 7 and older. Junior Golf Program (Middle School Age Golfers): The program will begin June 9 at each of the city golf courses. Call the golf professional for more information. League & Tournament Play: For updated league and tournament play, please call the course directly. At all City golf courses, there are men's and women's golf associations seeking to add new members. Please contact the Pro Shop at any course to receive additional information and sign up today. Annual passes (including tax) can be purchased at all four courses! Unlimited golf at all four city courses. For more information or to purchase, call (505) 768-5371. Available for rent at Arroyo del Oso and Puerto del Sol golf courses. Please call the Pro Shop at either course for more information about safety guidelines and enjoy a round of golf today! Municipal Golf Advisory Board meetings are held every month on the third Thursday - 3 p.m.
We would like every child to have the opportunity to learn and play the game of golf. We need help in making sure every child has equipment in order to practice. Donations of children's golf clubs will be accepted at all City Courses. 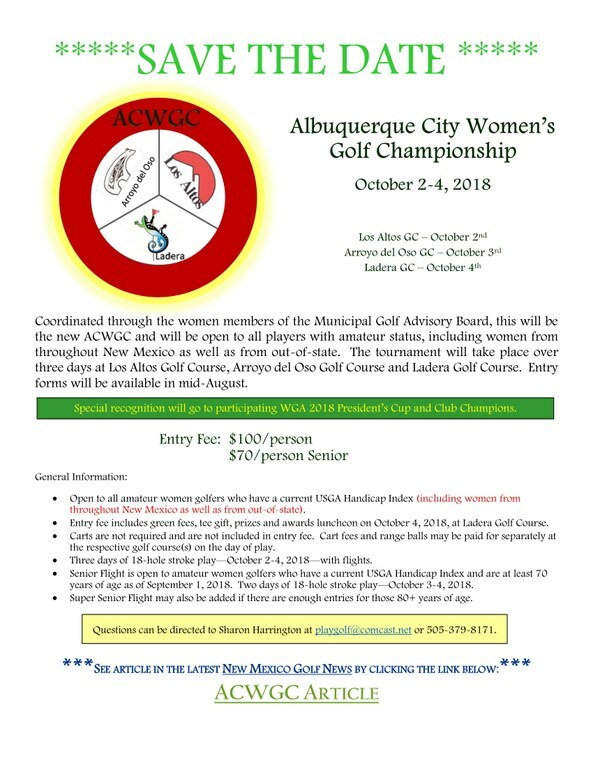 Coordinated through the women members of the Municipal Golf Advisory Board, the 2018 Albuquerque City Women's Golf Championships will be held October 2-4, 2018. The tournament will be open to all players with amateur status, including women from throughout New Mexico as well as from out of state. The tournament will take place at Los Altos Golf Course, Arroyo del Oso Golf Course, and Ladera Golf Course. Entry forms will be available in mid-August. For more information, click the image below. Click here to download an entry form. Practice your swing on our light driving range or 6-hole short course. Equipment rentals available. View information about the Balloon Fiesta Park Golf and Event Center. The City of Albuquerque's Golf Division is committed to providing excellent customer service and affordable quality golf.